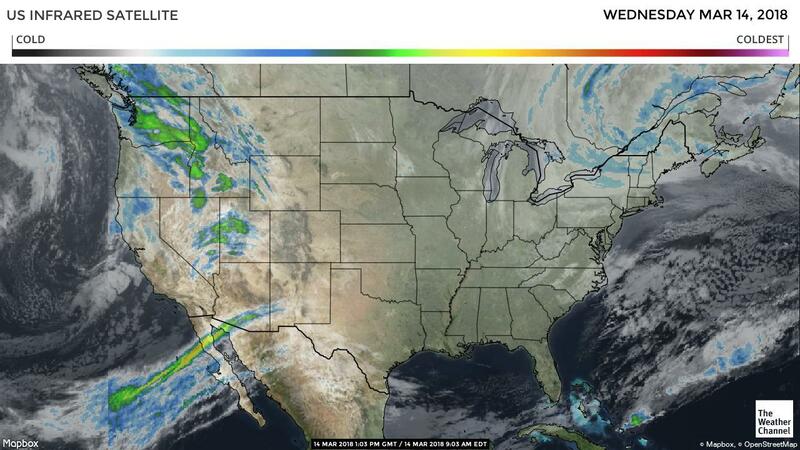 The cool, wet pattern will continue out west through next week as a series of storms systems sweep into California. A cut-off low-pressure system is forecast to form off the Southern California coast early next week. There is a strong flooding concern in the Ventura/Santa Barbra region due to the massive wildfires in the area this year. The Southwestern Deserts along with Northern Mexico will see a cool down, strong winds and a slight chance of rain as these systems pass to the north. Persistent high pressure continues over Central Mexico with above-average temperatures into next week. Florida will see slightly cooler temperatures through the week with a weak cold front expected to bring showers to the northern half of the state early next week. California/Yuma trucks continue to be steady. Washington apple truck supply is adequate. Idaho onion/potato trucks are steady as well. The national average for diesel remained steady is currently at 2.976 per gallon. An increase of .412 from this time last year. 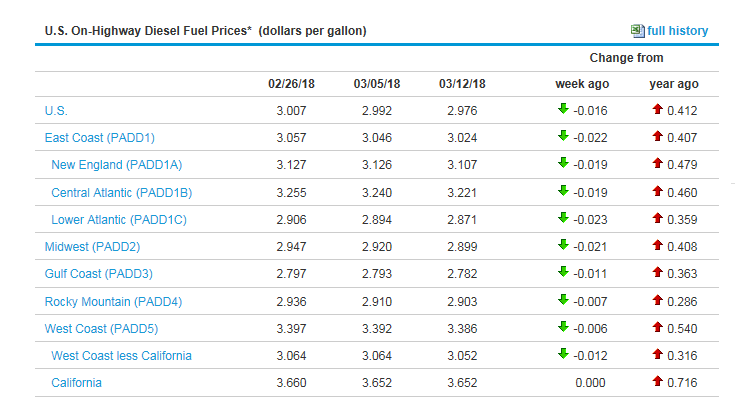 California prices remained at 3.652 per gallon. Crude oil remained steady and is currently at 60.74 per barrel. Washington – Red Delicious, Golden Delicious, Granny Smith, Galas, and Fujis are all fairly steady with good volume of 113 size and smaller. Some suppliers are dealing for volume of small fruit. Honeycrisp are steady to higher due to light supplies. The rising star varietals are mostly steady with a few volume deals on 125/138s. The quality has been good for all. Idaho – Golden Delicious, Red Delicious, Granny Smith, and Pink Ladies are steady. Grannys are still peaking on 72/80/88s, Reds are peaking on 113/125s, and the Pinks and Goldens are peaking on 113/125/138s. They have finished packing and are just cleaning up their inventory. The quality has been good. Michigan – Red Delicious, Golden Delicious, and Galas are steady but strong. McIntosh, Fujis, red Romes, Ida Reds, and Jonagolds are all steady. Supplies are starting to get slim, and some varieties are already finished for the season. We will still see, and early finish and some shippers are managing how much fruit they pack, so they don't finish early. The quality has been good. Pennsylvania – Red Delicious, Golden Delicious, and Empires are the only varieties left, and the markets are steady. There is still price-flex for volume on small red and golden delicious. Red Delicious are peaking on 88/100s, and the Goldens and Empires are peaking on 100/113s. The quality has been good. New York – Galas, McIntosh, Red Delicious, Golden Delicious, Red Romes, Empires, and Ruby Frost are all still available. Most varieties are peaking on large fruit although red Delicious, Galas, and Empires have been producing more smaller fruit lately. The quality has been good. We expect to see the first Chilean Galas at the end of this week. Washington is in the peak of its Red Delicious, Golden Delicious, Gala, Fuji, Granny Smith, and Pink Lady apple season. Michigan is in the peak of its Red Delicious, Golden Delicious, Jonagold, and Gala apple season. New York is in the peak of its Red Rome, Empire, McIntosh, Red Delicious, Cortland, and Gala season. Pennsylvania is in the peak of its Red Delicious, Golden Delicious, and Empire apple season. Volumes have not increased in Caborca or San Luis, Mexico due to cooler weather in the region. This weather pattern will continue for the next week. Rain and cold weather is expected in Gonzales, CA for 4 of the next seven days which will slow production down. Peru should start up at the end of this week with light volume. Overall markets are higher due to less volume, and weather in both regions. Peru should start up at the end of this week with light volume. California is harvest is picking up, and weekly volumes are anticipated to increase through the month. Expected rains this week and next could limit some harvest in some areas. We still see a good portion of fruit being sold to overseas export. Mexico's harvest and shipment volumes are steady. This is expected to be the same in the up week's. Size remains skewed heavily toward smaller fruit and grade 2 fruit. We are expecting this trend to continue through March. 48s and larger sizes remain on the tighter side of supply. Eating quality is very good, and fruit is ripening evenly. Growers in south Florida are still working on older fields waiting on newer ones to start, cooler weather over the past two weeks has slowed spring crops. Supplies are good on smaller sizes. There are good deals on medium and small size pepper. Most of the pepper in south Florida is showing the wear and tear of older fields and wind the region has experienced for the past few months. Look for newer fields to start in about two weeks. Supplies are light on Jumbo size bell pepper. Quality is only fair. Mexican blackberry production has recovered from the weather challenges and will be ramping up to spring peak over the next 3-4 weeks. Quality has been fair but is expected to improve rapidly as new varieties come into play for this time period. California production has been delayed to cooler weather, but will increase as we begin April. Georgia is expected to start by May. Market prices have stayed flat. California production will slowly ramp up as we begin April. Georgia is expected to start by May. Mexico is expected to hit its second peak over the next several weeks. Chile is expected to finish in the next two weeks, Mexico is over their peak and is gradually declining, while Baja, California and Florida ramp up. Availability may become limited for the next couple of weeks as we transition production areas, then we will recover quickly the first part of April. Pint availability will be minimal during this time. Georgia production is expected to start in the next 4-5 weeks. Quality has been good, with some instances of small and soft fruit from Chile. Market prices have been increasing on the Mexican harvest as the quality is stronger, but has remained steady on Chilean fruit. We expect to see a jump in prices as we transition into domestic harvest over the next couple weeks, then gradually taper off. California, Florida and Baja are expected to ramp up production over the next 2-3 weeks. Georgia will start in 4-5 weeks. Raspberry production is expected to remain light but steady into April. Then we should see an increase as the California growing regions ramp up. Quality has been good, and the fruit is eating really well. We did see a slight increase this week in pricing, but we anticipated markets to stay steady for the next 3-5 weeks until production picks up domestically. The rain that hit the California growing regions over the weekend was not as severe as anticipated. Yields were better than expected and fruit was readily available in the front part of the week. However, the forecast is calling for more rain as the week moves forward. We do expect supplies to possibly get snug by the weekend. Florida also did not get affected by weather this weekend, and growing conditions have improved this week. Most shippers are expecting harvest to come to an end over the next week, but we may see some try to push through the end of the month. Mexico harvest is done for all but Driscoll's, as they are in higher elevation land. We expect supplies to be available through April. Overall, quality has been fair in all regions. We are seeing some occasional bruising and soft berries. With more rain in the near future for California, we may see a decrease in quality over the next couple weeks. Market prices have remained fairly steady in all locations. We may see some slight increases in Oxnard and Santa Maria over the next week. Florida will wind down quickly over the next week. Santa Maria will increase production over the next 2 weeks. Salinas / Watsonville will not see any substantial volume for another 3-5 weeks. The broccoli market is finally showing some relief. The severe weather in the northeast and increased supplies from the Salinas growing region has created a downward trend in the market. Quality has also improved in all growing regions with minimal yellowing or dehydration. We have transitioned to Salinas but still have other growing regions harvesting broccoli. The brussel sprout market is trending higher as supplies from Mexico have decreased. This is putting pressure on the California supplies. Quality is excellent with a full range of sizes, vibrant green color, and no decay. California carrot supplies are good on value-added packs and medium-size carrot. We are still seeing a lower than normal percentage of jumbo sizes coming out of the fields. The cauliflower market is finally declining after weeks of extremely higher than normal prices. Supplies are increasing out of Salinas, while Yuma finishes their season. This has been coupled with extreme weather in the northeast curtailing demand as well. Quality has improved in the Salinas growing region with good weights, minimal bruising / brown spotting, and vibrant white color. Good supplies continue to be harvested in the southern California region, and this has kept the market steady overall. Production in Yuma is moderate but ample to fill most orders. Demand is average. Large sizing has the best availability, and the best deals continue out of Yuma. Slight mechanical has been reported, but the overall quality is good. The cool weather throughout this week will not affect production. Although rain is in the forecast this week, promote this item if possible. Shippers are dealing on volume type orders. Cilantro supplies continue to be limited from all growing regions. Yuma is finishing up their season. Mexico is still dealing with the after effects of the freeze. Oxnard and Santa Maria are trying to fill the void with little success. Quality is fair at best with freeze damage from Mexico, yellow to brown leaves in other growing regions. The market is active and looks to trend that way into next week. The Central Valley crop is in full production and sizing is large, peaking 115s/95s/140s, mostly fancy grade. Ventura crop continues to pick up the pace with better production and peaking on 140s and smaller fruit, heavy to choice grade. Limes continue to be a moving target this week. More rain is expected in Mexico by the weekend, so growers are jumping in and harvesting whatever sizes are available between storms. This is leading to an overabundance of some sizes while other sizes remain very tight. These situations also cause unstable markets as we may see a push on a particular size for a few days, then prices shoot back up. Unfortunately, this will continue to be the case until Mexico experiences some consistent weather. We expect things to improve by the end of March. Navel crop and market continues unchanged. Crop is peaking on 72s/56s/88s and looks to be this way through the balance of the Navel season. Wet weather is going to be an issue; rains in the growing areas this week will disrupt picking fruit, which will start to affect availability by the end of the week into the first part on next week. The current extended forecast shows another wet system coming in mid-week next week. The Honduran cucumber deal is starting to wind down for the season, a few shippers will continue through most of April, but the volume will be greatly reduced. The spring Florida deal will start light volume this week but volume will be very light, and quality reports on the first cucumbers are not good. Traditionally the first spring cucumbers are not great, they have been through a lot of wind and big temperature fluctuations causing irregular shaped and scared fruit. Honduran Cucumbers are starting to wind down for the season. There are light supplies of eggplant being produced, and light demand is keeping the market in check. Shippers are simply working off small acreages until the spring crop starts in a couple of weeks. Eggplant does not grow well in Florida as far as yields are concerned during the winter months and battling Mexico has become increasingly difficult. Quality has been good on the supplies available and should get better after this week. The red grape market is stable with available product. Volume is stable with product available in storage. There are a wide variety of sizes and varieties available. Quality is slowly getting better and more consistent, as low-quality red grapes have finally moved out of the marketplace. Quality should remain good for the remainder of the Chilean season. The green onion market is relatively competitive. As supplies from Mexico have been steady crossing the boarder, shippers have been willing to offer deals. Quality is much improved with minimal yellow to brow discoloration of the tops that we have been previously experiencing. The kale market remains flat and competitive. We continue to see ample supplies from all growing regions. Quality is excellent with dark green color, full bunches, minimal yellowing or dehydration. Demand has picked up dramatically. This market is active. Huron is expected to begin production next week while Yuma should be winding down the first week of April. Overall, the quality in Yuma has been fair. Quality reports have this commodity as a light green color, frost damage, irregular shaped heads, mechanical, brown discoloration, and some puffiness. The weights have been ranging from 41-45 pounds on liner. Southern California continues to struggle on availability. There will be a gap in pricing in the marketplace as suppliers fluctuate with their harvesting numbers. Huron is expected to begin production March 19th. Light supplies on romaine will continue throughout this week. This market is active. Value-added contracts as well as carton contracts are escalated. Green and red leaf are active as well, while butter is steady. Due to rain and cool temperatures, there have been issues on quality. Defects that have been reported include mechanical, blister and peel, twisting and a bit of ribbing. Huron is expected to begin production in the last week in March. Salinas will have some production near the end of March as well. Leaf items in Huron and Salinas will begin approximately the last week in March. As we finish the Yuma season, supplies are limited with arugula. Baby spinach, cello spinach, baby kale, and spring mix supplies are steady on the conventional side. Although supplies of organic tender leaf items have been limited as well. Quality has improved out of the Yuma growing region with little bruising or wetness. The market is also steady. We will be transitioning to the Salinas growing region in 4 weeks. Cantaloupes are steady on 9/12s, but 15/18s are higher. The size profile is larger with most shippers now. Most shippers are still peaking on 9s and jumbo 9s. South Florida still has the best availability. The quality has been good. Smaller fruit is short with most suppliers. Mexico will start packing in mid April. Both Honduras and Guatemala are in the peak of their seasons. Honeydews are more steady on the 5/6s while 8's vary widely. Most shippers are peaking on large fruit right now, but some have smaller size. Most packers are peaking on 5s and 6s with only a few 8s. The quality has been good. Mexico is scheduled to begin harvest in mid April. Markets on all colors and sizes out of the Northwest or New Crop Mexico have little change from last week. Quality is good out of all shipping points. Supplies out of Idaho are starting to wind down with some of the smaller growers already finishing for the season. This will have little effect on the markets but could become a factor as move growers finish as we get into the front of April. Transportation availability is good. Washington – D'anjou pears are steady to lower on 90s and larger, steady on 100/110s, and steady to higher on 120/138/150s. D'anjous remain large and so small fruit is short. Bosc pears are steady to higher on all sizes due to light supplies. Bosc continues to peak on US#1 80/90s. The Bosc pear season should last through April. Red D'anjous are steady on all sizes, and they are still peaking on 40/45/50 half cartons. The red pear season should also last through April. The quality for all has been good. Offshore – the Chilean Bartlett market is steady to lower, and they continue to peak on 90/100s. Eastern supplies are down while western supplies are steady. Chilean fruit is still the bargain. The Argentinian Bartlett pear market is slightly lower as the availability is better on both sides of the country. The Argentine fruit is higher priced than the Chilean. The fruit is peaking on 100s and larger. The quality has been good. We will see imported Packham pears in approximately 3 weeks with imported Bosc coming about a week later. Washington is still in the peak of its D'anjou pear season. We are still in the peak of the Argentinian Bartlett pear season. Volume from the tropics is good. Easter pull begins next week and will see fruit start to tighten a bit. Size peaking 6s/7s. Markets slightly stronger the start of this week on most size cartons out of all growing areas. Retail bales remain steady. Quality in the storage remains very good. Supplies of Russet Norkotah out of Idaho are slowly winding down as they transition into 100% Russet Burbank variety by the middle to end of April. The size profile of the Russet Burbanks is slightly smaller peaking on 80 counts and smaller. Transportation is readily available with rates steady. Look for the transportation to tighten back up as we get into April and May. Lead time on placing your orders is recommended. Western Washington – red and gold potatoes are steady. A-size is still the peak size for both colors. They expect to pack until through the first week of April. The quality has been good. Eastern Washington – red and gold potatoes are steady and are still peaking on A-size. The availability is light for both colors. The quality has been good. Bakersfield, California – reds, whites, and golds are steady to lower on A and B sizes, others are steady. All colors are still peaking on A-size. They will transition to desert product the last week of the month. The quality has been good. Idaho – reds, and golds are steady. Both colors are peaking on A-size. Some shippers will flex on volume orders of A-size reds. The quality has been good. North Dakota – red and gold potatoes are steady to lower on As and Bs. They have a large storage crop and will be packing into June or longer. The quality has been good. South Florida – red potatoes are steady on all sizes. White and gold potatoes are slightly lower on A and B size. The quality has been good. South Florida is in the peak of its season for red, white, and gold potatoes. Idaho and North Dakota are in the peak of their red and gold potato seasons. There are better squash supplies on both colors. Yields in south Florida are bouncing back this week, and some new fields are starting in the central part of the state. Cool temperatures have held newer fields back from being in heavier production, which should change this weekend as temperatures warm back up to normal for this time of year. The market has stayed steady this week but could show some weakness by the weekend. Light volume of squash starting in Central Florida. Availability of Chilean peaches, nectarines, and plums continues to be light. Ship arrivals have been hit or miss. Sizing on peaches and nectarines are mostly in tray pack 48/50's and 54/56's with very few volume fill 60's and 70's. The market remains steady with good quality. Peaches will be wrapping up in the next 1-2 weeks, nectarines in the next 2-3 weeks, with plums for another 6-7 weeks. Quality will remain good for the remainder of the Chilean season. Diminishing supply against rising demand has pushed prices upward this week where markets are expected to remain steady/higher through the middle of the month. Florida rounds are trending smaller in size as harvests have moved past crown picks. As the demand increases for larger fruit, so will prices, shifting value buys toward fruit smaller in size. The Roma market has been mild most of the year with Mexico being the main supplier for the season, until now. With Mexico entering a bit of a gap and the round market elevating, the proverbial rising tide that raises all ships will in turn float Roma pricing upwards as less fruit is realized in the pipeline this week. Grape tomatoes are past their peak in production with springtime demand coming on strong. Markets have risen by as much as $5 and have potential to strengthen further as yields continue to shrink. Similarly, cherry tomato production has begun to wind down however demand remains flat helping to keep prices stable. An unexpected turn in the tomato market has occurred this week as Mexico suffers a bit of a supply gap boosting prices up off the floor from where they have sat most of the year. Mexico has boasted such tremendous supply over the past several months that many farmers are now abandoning older fields to cut losses choosing to wait for new areas to begin. It may be 2 to 3 weeks before we see prices ease off to the mandated minimums again. Until then, the buying market will look to imports as the cheaper alternative at a time when overall supply is declining. Rounds will continue to strengthen in price if the Florida market is strong. Roma tomatoes have tightened up quickly over the past couple of days resulting in a jump of $5 already. Lighter yields of Cherry and grape tomatoes are being realized as well, which in turn, has led to a stronger market as well. It is reasonable to expect this trend to continue into April when Spring transition provides for a new bounty of fruit.